Article from the Battleships Reunion in Moline, Illinois. MOLINE -- Fifty-seven years ago Thursday, Mike Hulen was below deck on the battleship Mississippi, listening to the freight-train-like rumble of the ship's guns. 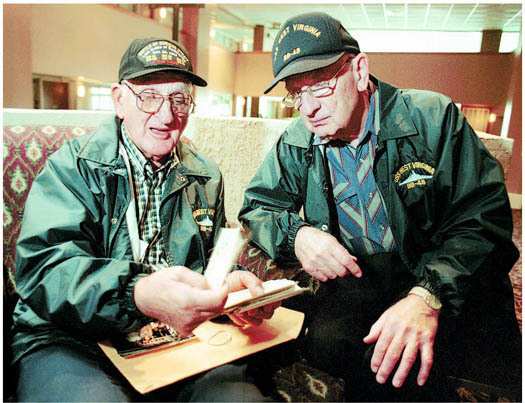 He and other surviving participants in the Battle of Surigao Strait gathered at the Moline Holiday Inn Thursday to share tales of the last battle between battleships -- the only such battle in World War II. ``We're living out history,'' said Mr. Hulen, of Swifton, Ark., who celebrated the anniversary with about 75 other survivors of the battle. They chose to meet in the Quad-Cities because of its centralized location. In the battle, the U.S. battleships West Virginia, California, Pennsylvania, Maryland, Tennessee and Mississippi sunk three or four Japanese battleships in the strait between the southern Philippine islands of Mindanao and Leyte, crippling the Japanese southern fleet and securing the Philippines. The battle, which started shortly before 4 a.m., was over in a matter of minutes, said Ed Lechner, a lieutenant commander aboard the Mississippi. Mr. Lechner, of Shaker Heights, Ohio, said the Japanese were trying to pin the U.S. ships in the middle of the strait, but miscommunication ruined their plans and left three or four of the Japanese ships open to a strike from the U.S. battleships. The Americans, crossing in front of a line of Japanese ships, were able to fire on the Japanese broadside, while the Japanese could bring only their forward guns to bear, Mr. Lechner explained. Because the Japanese ships were about 17 miles away, and it was dark, the men couldn't see them sink. After its southern fleet lost the battle, the Japanese northern fleet hung back, Mr. Lechner said, allowing the U.S. more freedom of operations. In less than a year, the U.S. dropped atomic bombs on Hiroshima and Nagasaki, Japan, ending the war. ``It's the only time in World War II when battleship faced battleship,'' Mr. Lechner said -- and also the last time that will happen, since battleships are no longer in commission. The days of battles on the open sea are over, he said. Battleships were primarily used during World War II to protect aircraft carriers and for land bombardment. Now the Navy uses carriers and submarines for firepower. However, Mr. Hulen and Mr. Lechner found a different parallel between World War II and the present war. They compared Japanese suicide planes -- kamikazes -- flying into their ships to terrorists flying commercial airliners into the World Trade Center towers and the Pentagon Sept. 11. ``We were going through that out there, but all the time,'' Mr. Hulen said. ``We were hit with two suicide planes.'' A lot of men were severely burned in the attacks, but kamikazes rarely sank the low-riding battleships, he said. The two men did recall seeing a kamikaze hit and sink an aircraft carrier. The survivors shared many memories Thursday evening. The reunion was the first to include survivors from all six battleships. In the past, pride in their own vessels kept the men apart, Mr. Hulen said. Each ship would have its own reunion. But now the men are now too old to let their arguments lead to fistfights, he said. Robert Christy of Upland, Ind., left, and Tony Reiter of St. Paul, Minn., look at photographs taken in the South Pacific during World War II at Thursday's reunion of veterans who fought in the last battleship battle of the war, the Battle of Surigao Strait, Oct. 25, 1944. Mr. Christy and Mr. Reiter, who served on the U.S.S. West Virginia, were two of many veterans who came from all over the country for a reunion at Moline's Holiday Inn. This story was published in The Dispatch and The Rock Island Argus on October 25, 2001.